An eternity band will surround her finger with a full circle of gemstones. Diamonds may be the first go-to gemstone that comes to mind, but emerald, ruby and sapphire versions are popular, too, adding a pop of color to this symbol of never-ending love. Choices include square princess, rectangular emerald and round shaped gemstones in bezel, channel, pave and prong settings. You will also find single- and multiple-row versions, rings inspired by lace and ribbon, and openwork designs. 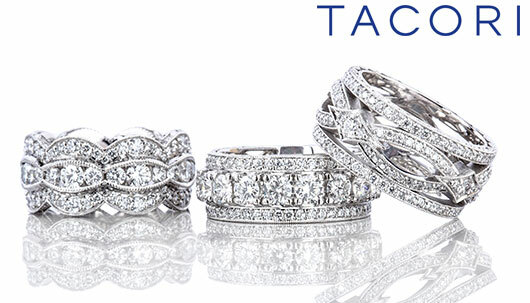 Virtually every bridal designer includes this style of ring in their collections, from Tacori to Verragio, Michael B., Scott Kay, Forevermark and Simon G. J.R. Dunn’s own artist-in-residence, the award-winning designer Robert Pelliccia, features eternity bands in his jewelry portfolio. An eternity band is a ring that will happily be worn forever.